Have your family?pets included! ?embroidered on a canvas made of organic stretched flax and cotton. It's no wonder the tradition of the family portrait has gone by the wayside. The process is long, tiring, expensive, and maybe just a tad stuffy. For a hip, affordable, and more peaceful alternative, look no further than the custom family wall art created by mother-daughter team Mary and Shelly Klein. 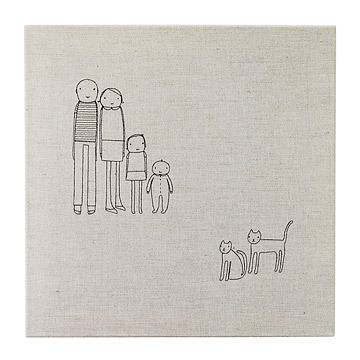 Choose from a set of featured characters that best resemble your nearest and dearest--including family pets!--and have them embroidered on a canvas made of organic stretched flax and cotton. Each piece is finished with a cardboard back and comes ready-to-hang. Handmade in Michigan. ERMAGERD !! It's AWESOME !!! This is the perfect gift for the person who has everything -- so unique and so personal !! Great present for my wife. She absolutely loved it. My 2 year old enjoys pointing at the characters and naming them. Very cool cartoons and I love that they're embroidered. My husband always wanted a family portrait and this was perfect. The product was exactly as described and we couldn't be happier with the result. That the portrait was produced by a local artist was an added bonus. Finally took the plunge and ordered this pillow after looking at it several times. I have three kids and I had them pick the person they thought was the best "look alike" for them. Our pug is also represented. It sits on the window seat in our kitchen (high traffic area) and I have already removed the cover and washed. Great quality, perfect size. Would buy as a gift in a heartbeat! This will make the perfect gift! Any family can be depicted in this original piece of art! Choose from numerous characters to create YOUR family.